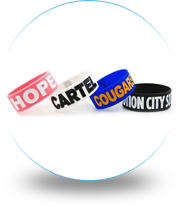 Debossed Wristbands are the most popular style of custom wristbands with good reason. These Debossed wristbands became highly publicized when Live strong launched in May 2004 and kicked off the wristband mania that is still going strong today. We like to call this band "Old Faithful". Debossed wristbands, which feature letters and images that look engraved, are the first of its kind. This is truly a pioneer of the silicone family. Your message will never fade away and is sure to be seen for years to come. 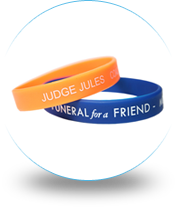 Debossed is currently one of four message styles offered for silicone/rubber wristbands. The method used for making debossed bands is to create them from a custom mold with your personalized design which achieves a deep-cut imprint into the bracelet to ensure long-lasting results. 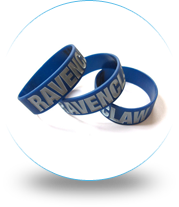 Our debossed wristbands are superior to our competitors in quality and pricing. 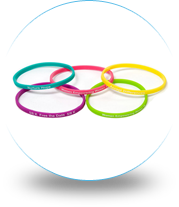 Our 100% medical-grade silicone bracelets are sturdy and strong, and you can be sure your message will not fade or wear away as opposed to the competition’s laser engraved wristbands. And, unlike other wristband manufacturers who require a minimum order of 100 or more wristbands, we offer the best prices starting at a minimum of just 50 custom bands! 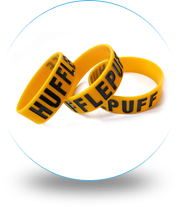 Your exclusive, personalized debossed wristbands can be used for a multitude of what, whys and wherefores. 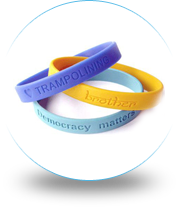 These Screen-Printed Bracelets are often utilized to promote cause and awareness. They are well known to be an extremely effective fundraising tool for charity and non-profit events. Whatever your purpose, you can be certain your unique personalized design will stand out and bring your message to life! 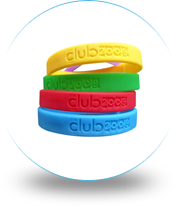 We can match any color you need using the Pantone Matching System located here and you can get debossed wristbands in three sizes according to their width: classic ½ inch, the bigger, bolder ¾ inch and, currently the largest popular width, the 1-inch band. Call us now at 1(800)715-4445 and one of our team members will gladly assist you in creating your tailor-made message using debossed customized bracelets!